My town recently installed a roundabout, or as I like to call it, survival of the fittest circle. While aesthetically pleasing and nice in theory, roundabouts present their own little version of hell. Oversized, mid-sized, and undersized vehicles all jockeying for position. Some employ the scrambling-to-get-in-method, and with barely a cursory glance, floor it and don’t look back. Others, hypnotized by the traffic pattern, sit glued to the pavement as traffic behind them is forced to play bumper cars. There is no eye contact in the roundabout, to look someone in the eye is to challenge the beast, or admit weakness. The whole problem at the roundabout is that nobody really gets it, but nobody wants to say that they don’t get it. So like high school on your first day, it’s cool-game-face-on and pretend like you know what you’re doing. Really, everyone has their own belief system or has made up their own rules when it comes to the roundabout. A friend recently posted on her Facebook page that she wished she had a paintball gun for when she had to go through the roundabout, because most folks can’t seem to figure out yield, stop, or go, let alone the more complicated concept of right-of-way, and use your bloomin’ blinker. So I wondered, what was it about the roundabout that is so intimidating? If we come to a normal intersection we don’t seem to face any dilemma, but roundabouts seem to pose a problem, and even a stress of some sort. Regular T-shaped intersections are predictable. It’s clear what you’re going to do and what everyone else is going to do. There’s no every-man-for-himself involved. Contrast that then, with the roundabout. We know where we’re going, but we don’t know where the other guy’s going. Conventional intersection: if someone’s in the turn lane–even without their blinker on–you know they’re going to turn. Roundabout: blinker or no you can’t believe the hype. You are in a kill or be killed situation. 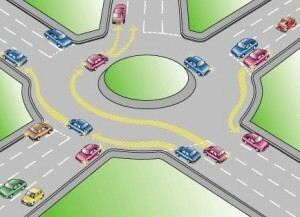 Roundabouts are the hunger games of driving. So why is that? Well, in my deep thinking, I’ve decided it’s because roundabouts are in some way a metaphor for life. I like the predictable. I like the routine. I like the organized. I like my ducks in a row, and I don’t want to have to use my crystal ball to figure out the future. I’m a standard intersection sort of girl. When things aren’t predictable, aren’t routine, and aren’t organized, I’m anxious, adrift, and even more scattered than I usually am. (and I’m a scattered sort of girl) There’s a popular quote ” Yesterday is history, tomorrow is a mystery, today is a gift of God, which is why we call it the present.”(Bill Keane-yup, the guy from Family Circus!) I’ve made peace with the past, and I’m fine with the present. It’s that future thing that can seem overwhelming. There are no blinkers or street signs to warn us of the zigs and zags and detours that are going to come into our life. Everyone’s life plays out in a different way, based upon their choices and circumstances. But in my case, it seems I get to spend a lot of time at yield before I finally get the green light to go. Often as I merge into the traffic snarl of life, I am gripping the wheel, white-knuckled and with a constant prayer under my breath. Those times are the hard times. Those times are the walk-by-faith times. Those times are the through-a glass-darkly times. In those times my GPS is my faith, and I’m grateful for the strong faith that I have. Other times, there are no traffic jams in my life, and every light is green. 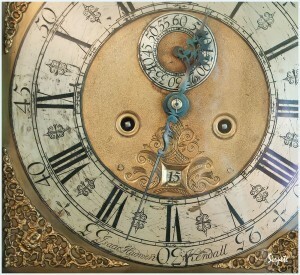 Everything flows smoothly-like clockwork, and isn’t a clock face really the same as a roundabout? A simple circle. It doesn’t have a beginning or an end. The truth is that even with the stops and starts in life, it’s all one eternal round. The course is set, and the journey’s already begun. Along the road are obstacles, breakdowns, sometimes even gridlock. But eventually order is restored, and I progress–wiser, but really none the worse for wear. So it’s my choice really, to embark confidently, firm in the knowledge everything’s gonna be okay even without knowing the outcome; or to hesitate–and even temporarily halt while I get my bearings, before proceeding cautiously. Kind of like the roundabout, the rules aren’t exactly clear. But instead of fearing the roundabout, now I drive that way on purpose, knowing I can conquer it. I don’t need safe intersections to guide me to my destination, I’ll get there in my own time and in my own roundabout way! There is a familiar quote from Hamlet which reads: “Neither a borrower nor a lender be.” But I have to confess, I have done both contentedly all my life-well at least as long as I’ve had a library card that is! I’ve borrowed countless books, donated others, and lent the checked out books to friends, (as long as they make it back before the dreaded due date). It was a happy day-the day l learned to read. Finally the undecipherable typed shapes and squiggles of secret-book code transformed into something I recognized, forming simple, easy, sound-out-loud-able words. 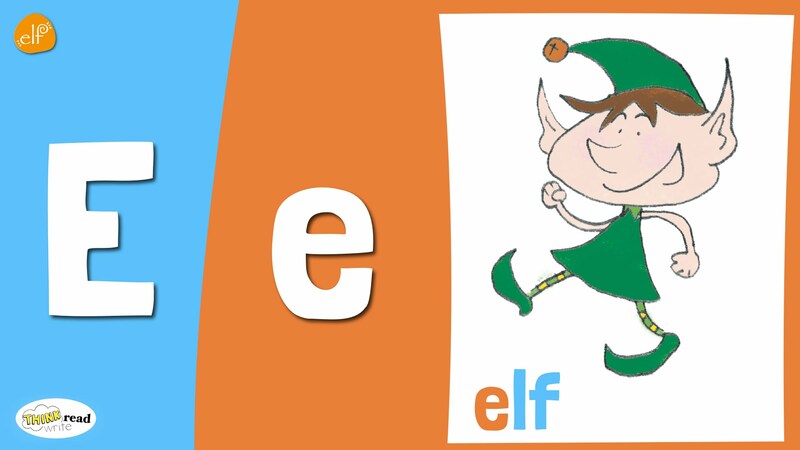 Thanks to my teacher and her phonics elf, (a hand-puppet helper) I was actually reading!!! No more picture book section at the library, from now on it was easy-reader all the way for me. Thus started my love of reading and books. As a kid growing up we had a small library in town, but what a difference that library made in my life. Weekly trips to check out books were a highlight of my summer. We were even allowed to ride our bikes along the muddy ditch bank, till we emerged onto the meandering back roads that led to the town library. We were literally a one stoplight town, but it seemed a big thing to do back then. Our humble library had a resident cat named Figaro. He was known to cat-nap a lot of the time, as most cats do, but he loved, and was beloved by all the library patrons. Often, as you were browsing through the wooden bookshelves, a furry paw would snake through the opposite side and cuff at the books and dust motes. Other times, a prickly, uneasy feeling would descend-until Figaro was spotted playing I spy, his cat-eyes staring down from a high shelf. 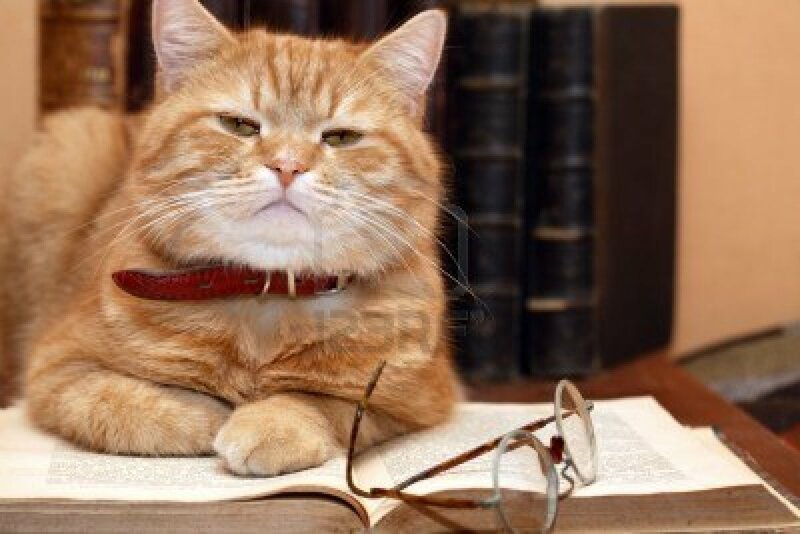 I’ve never gone into a library since where I didn’t feel the lack–all because they didn’t have an in-house cat. Besides my tête-à-têtes with Figaro, I loved the smell and feel of the books and quietness of the library itself. I am not a quiet person by nature. Unfortunately, I’m a bit exuberant and chatty. (Back then we didn’t have ADD-well obviously we did-but we didn’t label it so I didn’t know.) The library, like church, is one of those places where even as the doors shut they seem to whisper hush. My brother, who is two years younger than me checked out the same book every time. Apparently back then there weren’t rules against that, or maybe we just had nice librarians, but Go, Dog. 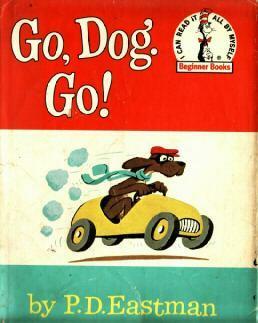 Go!, by P.D. Eastman was his book of choice. That book is still a treasured favorite in our family today. I loved the Ramona books, Pippi Longstocking, and Harriet the Spy, Nancy Drew, The Bobbsey Twins, and the Five Little Peppers. Too many favorites to count. Checking out the books was an adventure in itself. Using a tiny yellow pencil, I loved signing my proper name on the line of the check-out card inserted in the little pocket inside the book. 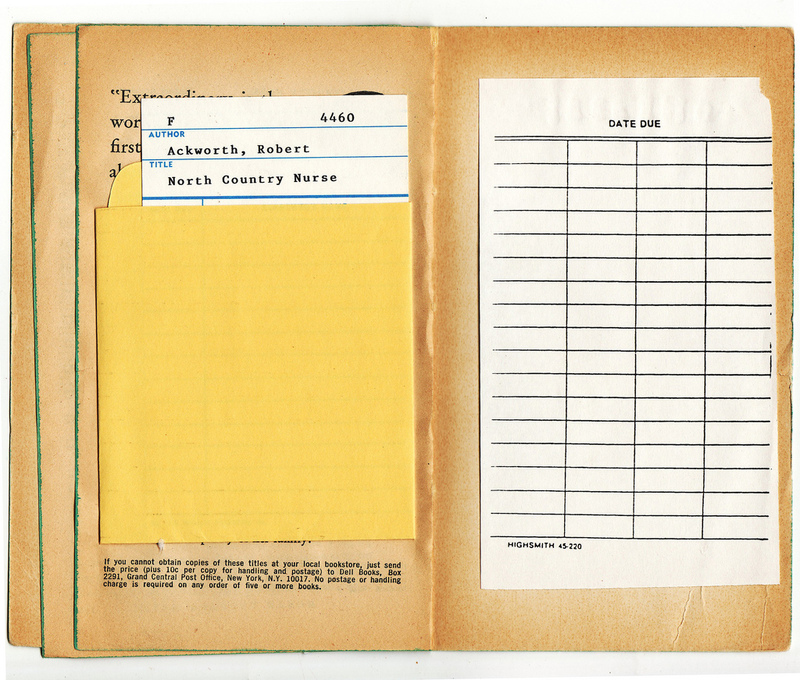 The check out card had a wealth of information, the names and dates of everyone who had previously checked out the book. Sometimes, I would recognize the name of a school mate. Other times, (after a long break, because I didn’t want the librarian to think I was a weirdo like my brother,) I would check out the same book again to see my own name from the past on the card. The librarian would stamp it firmly with her date stamp, and crisply remind me of the date due two weeks hence. Libraries are a wonderful shared gift. Everyone’s welcome, and you can learn about anything absolutely free! Libraries are constantly evolving way beyond their original purpose- books. You can check out videos, access all types of music, attend a class or seminar, or simply use their computers. They are schools where you determine the curriculum, and provide lifelong learning. One of the most neighborly and community-friendly things I’ve ever seen is a Little Free Library, also known as a pop-up library, or a neighborhood book exchange. 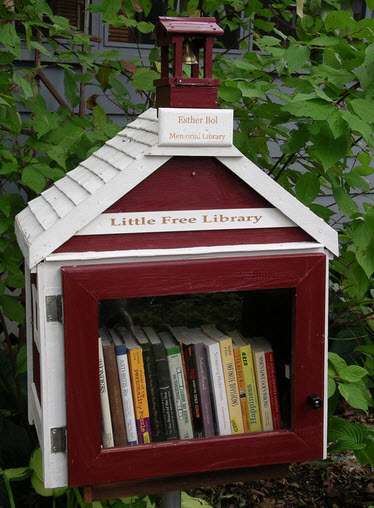 A Little Free Library is a book container, barely bigger than a bird-feeder, usually on a post or a tree, and it is a book swap; where books are borrowed, returned and donated, all on the honor system. The original Little Free Library was a small wooden school house atop a post, crafted by Todd Bol in 2009 as a tribute to his mother. What better gift to his mother who was a school teacher and loved books, than for him to share her love with others? (I don’t know about you, but I’d rather have a little lending library than a tombstone any day!) The mini-libraries caught on, and are popping up in all types of communities: from neighborhoods, to rural areas having no libraries of their own-and in emergencies, to offer respite to those areas recouping from disaster. The Little Free Library’s motto is Take a Book, Leave a Book, putting that old borrower/lender adage to rest-once and for all. September is National Literacy Month, and as my contribution to promote literacy I plan on embracing my shelf life. I think I’ll read a book, or maybe even write a book- okay, I guess I’ll stick to writing a blog. And hopefully, someone out there somewhere is reading it.